Some people are just great liars, and some are so great at it that history remembers them for it. You’ve heard of most of these people but did you know how they got where they are today (in history books)? They were really good at lying or rather, at bluffing. We hope these stories are going to entertain you and show you how sometimes it is so easy to deceive people, or even nations, just by being a great actor. Mark Twain, Napoleon and Bill Gates were like that… and many more. Well, we all know the story. It’s probably the most famous bluff in human history. Stories have been told, movies have been made about the Greeks who got this super-clever idea to hide inside a wooden horse and win a war. So, how did they decide to do that? Well, after ten years of a siege that wasn’t paying off, the leader of the Greek army realized that they are going nowhere with this strategy, so they decided to start fighting with their brains instead of their bodies (at least until they get inside the fortress). 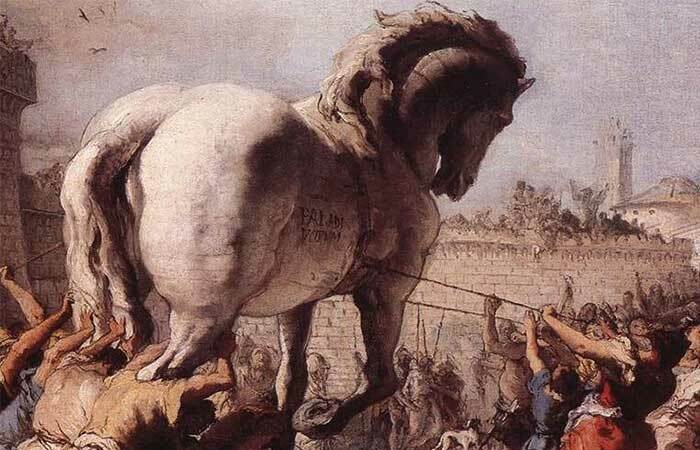 That is why they pretended to sail away and leave an enormous wooden horse as a present to the city of Troy. Honestly, the Trojans should have never bought this. But, they did, and the rest is history: the forty selected men who were hidden inside snuck out in the darkness of the night, opened the gates and let the rest of the army inside. They destroyed the city and won the war in just one night. Well played, Greeks. Well played. It’s easy to say this when you don’t have a gun pointed at your face, right, Mr. Clemens? It was the 19th century, back when dueling was a popular pastime for manly men. 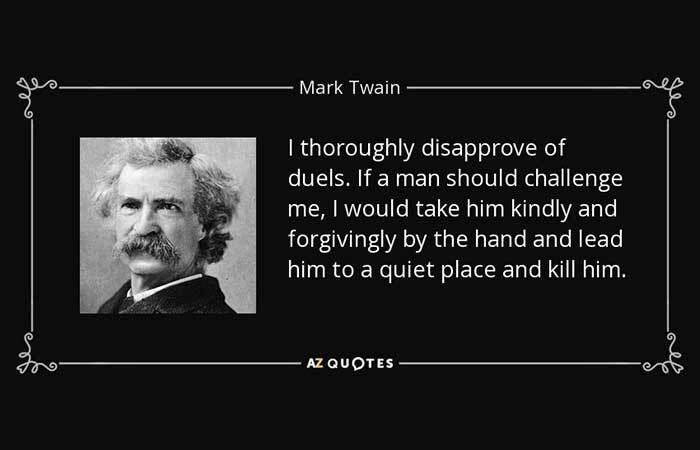 In Nevada, a newspaper editor called Samuel Clemens was challenged to a duel by his rival editor, Mr. Laird. He accepted the invitation, but there was one little problem: he had no experience whatsoever when it came to aiming and shooting. Luckily, his good friend Steve Gillis offered him a hand and Clemens happily accepted it. Alas, it seemed that Clemens was just not talented for these kinds of operations – he couldn’t shoot a single target. He began despairing, because it was a widely-known fact that his opponent, Laird, didn’t have such issues. That’s when luck had its way and saved the life of the sad editor: his teacher shot a bird in a single shot and at that exact same moment, Laird’s right-hand man walked by and watched in amazement as the bird fell. He didn’t see who made the shot, though, and Gillis took the opportunity to save his friend’s life. He told the man that Clemens just shot that bird at thirty paces distance, and the man believed his bluff. He reported this event to Laird, who got scared and decided to back out from the duel. So, what does all this have to do with Mark Twain? Well, Samuel Clemens and Mark Twain are the same person – Mark Twain was just his pen name. At a more recent day, around a century later, a bluff saved lives of many more people. In 1983, there was a plain that was flying from Sofia to Varna that was hijacked en route. The hijackers demanded that the plane take them to Vienna, and wouldn’t give up on the idea even after the pilots explained that they didn’t have enough fuel for that kind of trip. They threatened the pilots and in the end they had to agree to fly to Vienna. The thing is, when they said they don’t have the fuel for that trip, they were not lying. 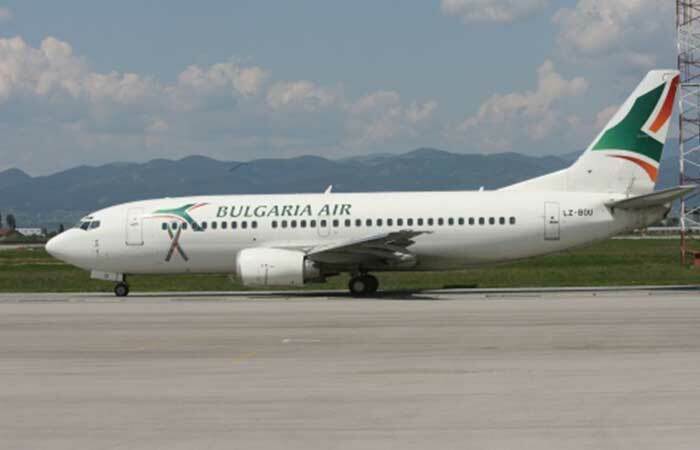 Since the hijackers were threatening to blow up the entire plane, they promised to go to Vienna, but in fact continued their flight to Varna. They circled above the city until they started to run out of fuel, and then they landed at the airport. But that wasn’t the biggest bluff of the day. During the flight, pilots managed to inform people down on the ground of what was going on so the entire city worked together to save the innocent people. The electricity was shut down so that the hijackers don’t recognize the town and two men from the airport who spoke German well pretended to be the Vienna airport staff. When the plane landed, the disguised “Austrian” employees negotiated with the terrorists, while the police, also disguised, managed to enter the plane and managed to capture them before they realized what was going on. One of them had to be shot during the fight, but luckily, all the passengers and the pilots were left intact. This World War II operation was so well planned that it managed to trick the German army to go in a completely wrong direction, thus allowing the Allies to attack Sicily. It all consisted of sending a secret agent to the Spanish, who were at that time suspected to help the Germans, and have him convince them that an attack in Greece was about to happen. The thing is – this was a bluff, and the agent, well, he was dead. How can a dead person convince anyone of anything, you may be wondering. Well, if equipped in the right way, he can. So, what the British did was plant a dead body carrying fake documents saying that the attack at Greece was being planned. 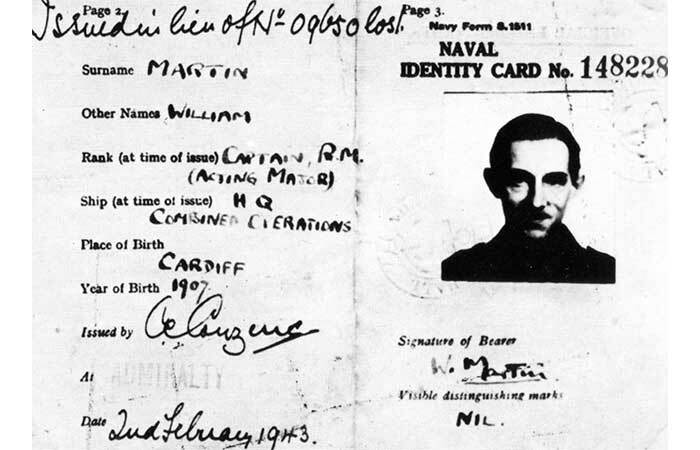 That’s not all – they invented a whole life for a Major William Martin of the Royal Marines, including a fake girlfriend whose letter and photo he was carrying. In addition, the British newspapers reported a military casualty with that name, all in hopes that the Germans would take the bait… and they did. As a result of this bluff, they moved their armies to Greece, allowing the Allies to take over Sicily without much fuss. This guy… there’s no words to describe it. What was he thinking and why he did what he did, we will probably never know for sure. What we do know is that his whole performance at Nelson Mandela’s memorial service was totally made up. 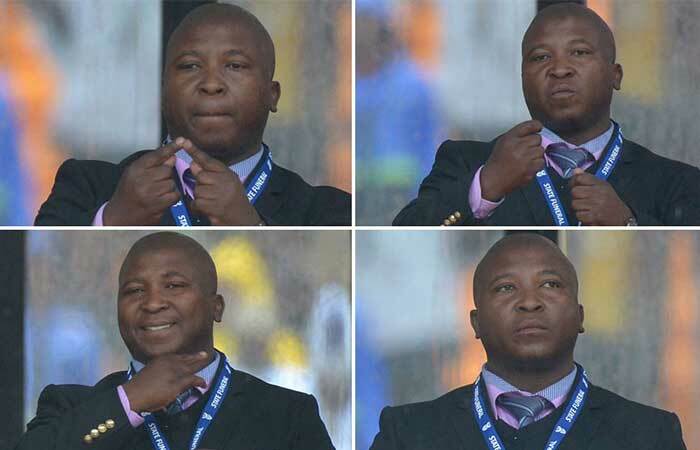 The Deaf Federation of South Africa confirmed that he was only “waving his hands around but there was no meaning”. And it lasted for hours. If he thought he wouldn’t be caught, that was really silly thinking, knowing that the biggest media outlets broadcasted the event. He tried to justify himself by saying that he had a schizophrenic attack, probably because of the magnitude of what he was supposed to do or the happiness he felt for being assigned such an important task. Whatever the reason was, it was a bluff that went really, really bad – so bad it’s great. Check out his performance on this YouTube video. This one wasn’t actually meant to do what it finally did, but it does show how influential mass media is, and was, even back in 1938. 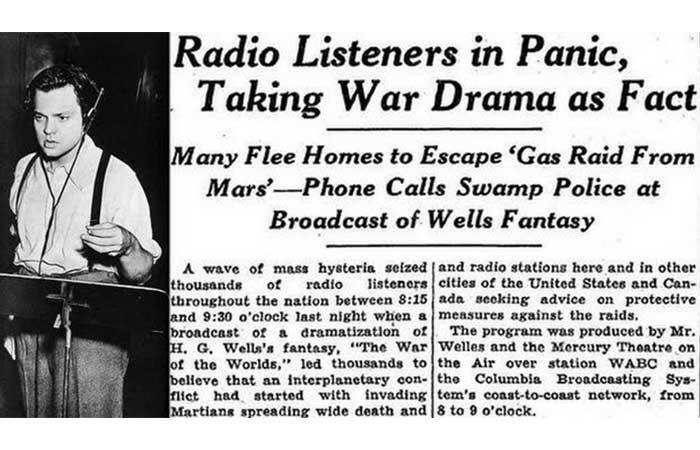 It was meant to be a simple radio drama featuring H. G. Wells’ novel “War of the Worlds” but in the end it caused mass panic and hysteria. So, to make it more believable, this radio drama was played on Halloween. It was a part of The Mercury Theatre on the Air series broadcasted by Columbia Broadcasting System. It was narrated and directed by Orson Welles, who became very famous after it. The drama was presented as a series of news bulletins saying that an alien invasion by Martians was happening – and people massively believed that this was the actual news report. The thing is, in the beginning and several times during the show, it was mentioned to be a drama. Whether the people just missed the announcement in their panic or just never listened at the right time is still unclear, but not only the public believed it – the police and the government were hooked too. So, what was meant to be a simple radio drama resulted in one of the greatest fears the people of America had in the 20th century. Another great bluff that happened during the Second World War must be mentioned, and this time it was in Poland. The citizens of a small town called Rozwadow tried to defend itself from the Germans in any way possible, and luckily they had some smart doctors as citizens, who thought of a great bluff that actually worked. Dr. Eugene Lazowski and his friend Stanislaw Matulewicz saved their town by inventing a fake Typhus epidemic. It was widely known at the time that the Germans were terrified of this infectious disease, so the Polish used this to their advantage. But, how do you fake an epidemic? According to Stanislaw Matulewicz, not as hard as you’d think. He realized that, if you inject a healthy person with dead Typhus bacteria, they are still going to test positive for it. 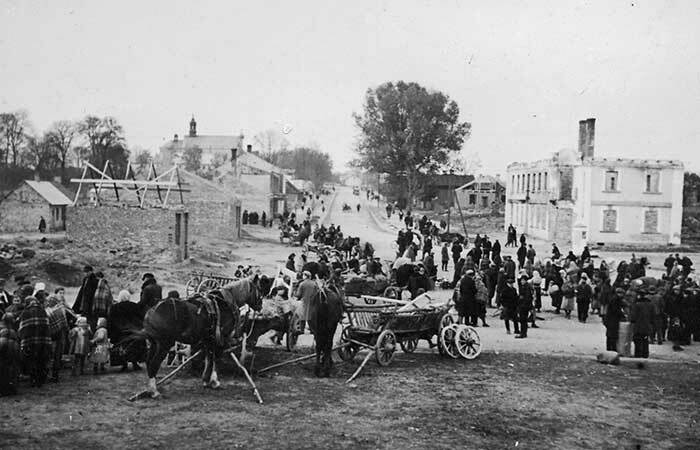 So, he did it to all the citizens of Rozwadow, making the Germans believe that the danger is very near them and they need to quarantine the area – which they actually did. Also, no one else from this town was taken to a work camp or concentration, and no Germans dared to come near them either. Well done, misters Lazowski and Matulewicz! The first step to where he is now happened over 30 years ago… and it was a bluff. 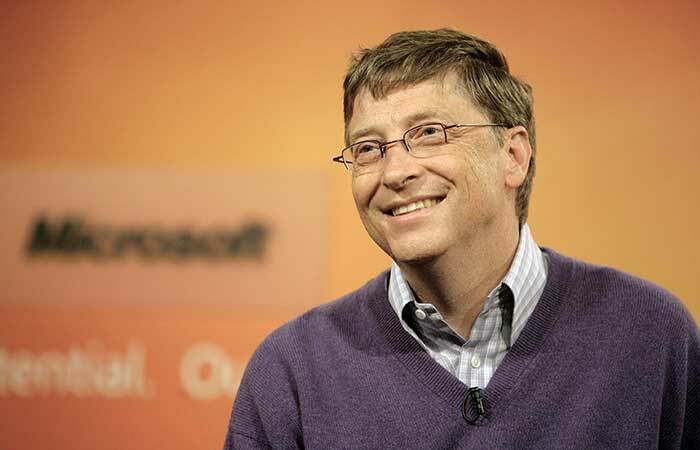 Bill Gates has proven many times that he is a very clever man – and this was the first one. It happened over thirty years ago, when the world witnessed the birth of a Personal Computer. Napoleon showed once more what a great strategic he was. One of the greatest leaders of human history, Napoleon, was a great strategist, and this story will just prove it once more. 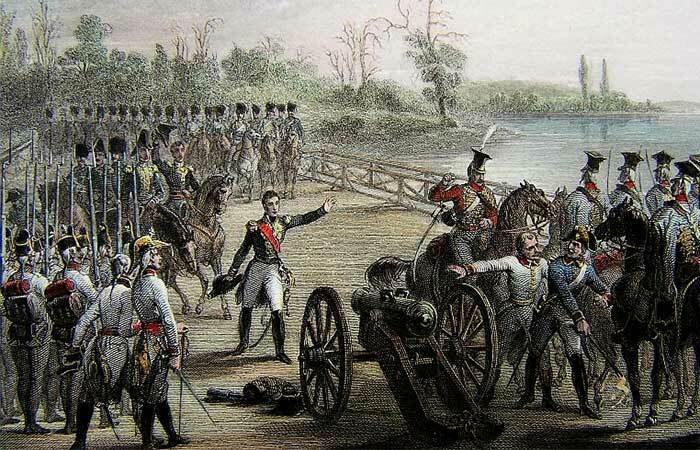 This is how this famous French (and all of his army) managed to cross a bridge that was mined and very well defended. There were guards watching over the Tabor Bridge in Austria, making sure that none of Napoleon’s soldiers crossed it. It was so simple it’s genius. So, this is what he did – he sent two of his generals, Murat and Lannes, to do something really… well, there is no other word to describe what they did than “badass”. They just went on and crossed the bridge by themselves. They shouted that there was an armistice in place and managed to convince the soldiers on the other side that it’s actually true. After crossing, they asked their enemies to call their commander, Count Ausenberg, which they did, and they charmed him as well as all the others. They actually bought the story of a truce… which was a lie, of course. The funniest thing is that one of the officer actually noticed when the rest of the army started crossing and tried to warn the Count… but he was completely overwhelmed with positive feelings for the two charming generals that he just sent him away. So, the army managed to cross the bridge with absolutely no casualties – simply because their generals were so nice… or such great actors. 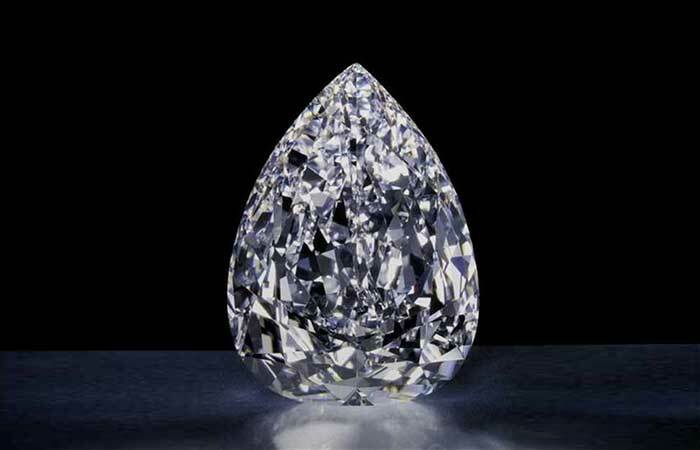 This was the biggest diamond in the world until the 1985 discovery of the Golden Jubilee Diamond. The Great Star of Africa, or a Cullinan Diamond was found in 1905 and was at the time the largest one ever discovered. It was discovered by Captain Frederick Wells, and it was supposed to be a gift from South Africa to the British king Edward VII. The question was: how can they send such a valuable item and make sure it doesn’t get stolen on the way? Well, the South African Prime Minister Louis Botha thought of an amazing way: he sent it on an enormous steamboat, with a great fanfare accompanying it, making it known worldwide where exactly it was and how it was protected. Just – the diamond sent by a boat was a fake one. It was a bluff created to make sure nobody will check any other means of transportation… because the real one was simply wrapped up and sent by post. A very brave move, and it paid off – the Cullinan Diamond arrived safely to the King. One of the greatest generals in China was feared by many… and for a good reason. Zhuge Liang was this very famous Chinese general who lived during the Three Kingdoms Period. He was known for being a great warrior and strategist and feared by many of his opponents. What he did couldn’t have been done by anyone – it took great courage and a reputation that he had already built. 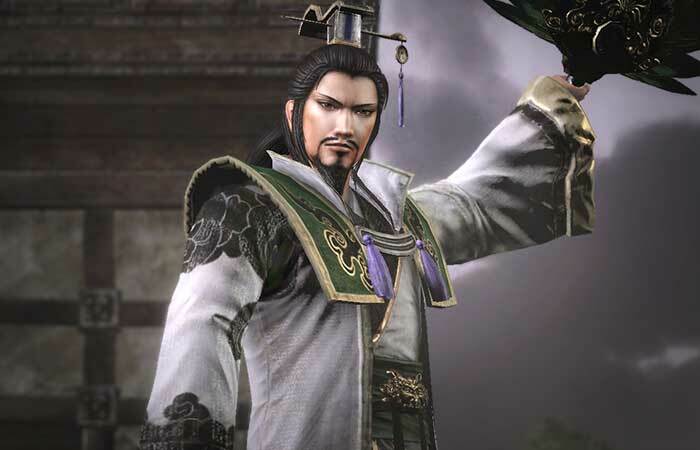 On that faithful day, Zhuge Liang was away from his town and in that moment, his rival Sima Yi appeared and was going to take over his city. At the point when he got back, it looked like there was no hope and the city was going to be conquered by a much stronger army. But, being the great strategist that he was, Zhuge Liang thought of a plan so crazy it actually worked. He ordered his people to open up the gates of the city – it would have been a piece of cake to march in. He told his army to hide away from sight and he went up to the walls… and started composing music. Like he didn’t have a care in the world. Knowing his reputation and having faced him many times so far, Sima Yi was totally stunned by the situation and after a lot of thinking and trying to figure out what this was all about… he decided not to risk it and just bypassed the city. Way to go, Zhuge Liang!